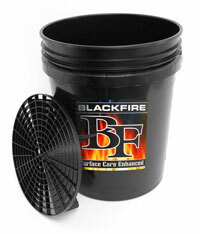 Maintain your BLACKFIRE shine without rinsing! BLACKFIRE Wet Diamond Rinseless Wash Essentials Kit is a combination of the most central products necessary when doing a rinseless wash – bucket, grit guard, quality microfiber products, and of course, the rinseless wash product itself. BLACKFIRE Wet Diamond Rinseless Wash Essentials Kit gives you the ability to quickly wash your car without the chance of instilling swirls or scratches. A rinseless wash generally a quicker option when it comes to cleaning your paint. However, if you use sub-par products, you may not achieve the desired results. The BLACKFIRE Wet Diamond Rinseless Wash Essentials Kit takes the guesswork out of which product, or towel to buy and bundles it all together for you! BLACKFIRE Wet Diamond Rinseless Wash washes fuses proprietary Wet Diamond polymers in a rinseless wash to give you the best of both worlds! The Wet Diamond tri-polymer system is extremely slick, allowing dirt and grime to be washed away with out scratching. It also coats the paint in a layer of BLACKFIRE Wet Diamond polymers leaving your paint, trim, and glass slick while creating the whiplash-inducing shine! 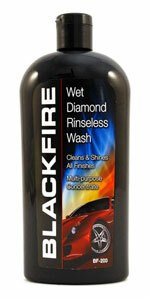 BLACKFIRE Wet Diamond Rinseless Wash is the most advanced rinseless wash today. A total retail value of $65.96. You save $20.96!